NASA’s new Mars rover Curiosity is resting safely on the surface of Red Planet after a daredevil landing that had the nation holding its breath. Now, mission scientists are anxious to start moving. 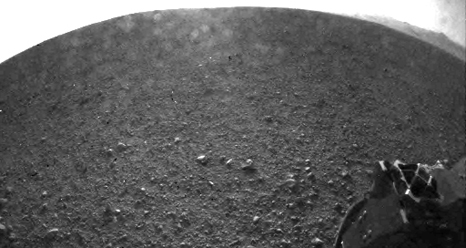 Curiosity is bristling with instruments custom-made to look for the chemical building blocks of life. Escape the heat of the waning days of summer for an evening of sky watching. The Perseid meteor shower peaks on the night of August 11 through the morning of August 12. Perseid rates can get as high as 100 per hour, with many fireballs visible in the night sky. A waning crescent moon will interfere slightly with this year’s show, but viewing should definitely be worth a look! Cloud covering the night sky in your area? Not a problem. On the night of Aug. 11-12, astronomer Bill Cooke and his team from the Meteoroid Environment Office at NASA’s Marshall Space Flight Center will answer your questions about the 2012 Perseid meteor shower via an “Up All Night” live chat. To join the chat, simply head over to this page and log in. The chat experts will be available to answer questions between the hours of 11 p.m. – 3 a.m. EDT, beginning the evening of Aug. 11 and continuing into the morning of Aug. 12. A key ingredient of Earth’s strangest clouds does not come from Earth. New data from NASA’s AIM spacecraft proves that “meteor smoke” is essential to the formation of noctilucent clouds. Forecasters say Solar Max is due in the year 2013. When it arrives, the peak of 11-year sunspot cycle will bring more solar flares, more coronal mass ejections, more geomagnetic storms and more auroras than we have experienced in quite some time. On the weekend of July 14, 2012, sky watchers around the world got a taste of things to come.It was mid-Saturday in North America when a coronal mass ejection or “CME” crashed into Earth’s magnetic field and triggered the most sustained display of auroras in years. For more than 36 hours, magnetic storms circled Earth’s poles. Northern Lights spilled across the Canadian border into the United States as far south as California, Colorado, Kansas, and Arkansas. In the southern hemisphere, skies turned red over Tasmania and New Zealand, while the aurora australis pirouetted around the South Pole. This lesson is a great extension to the NASA Explorer Schools featured lesson, Geometry: Space Math Problems—Solar Storms. To access this lesson, visit: the NASA Explorer Schools Virtual Campus website. 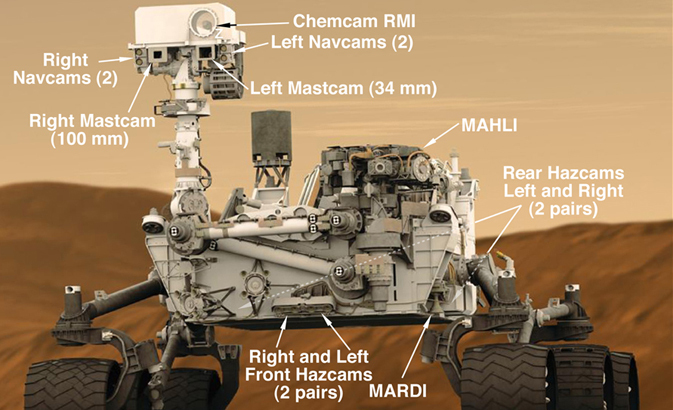 This graphic shows the locations of the cameras on NASA’s Curiosity rover. The rover’s mast features seven cameras: the Remote Micro Imager, part of the Chemistry and Camera suite; four black-and-white Navigation Cameras (two on the left and two on the right) and two color Mast Cameras, or Mastcams. This educational video highlights some of the challenges faced by humans on space exploration missions and the technologies needed for living away from the Earth. Intended for grades 3-8, and for anyone curious about space exploration. NASA’s most advanced Mars rover Curiosity landed on the Red Planet at 10:32 p.m. Aug. 5, PDT, (1:32 a.m. EDT Aug. 6) near the foot of a mountain three miles tall and 96 miles in diameter inside Gale Crater. The one-ton rover, hanging by ropes from a rocket backpack, touched down onto Mars Sunday to end a 36-week flight and begin a two-year investigation.